There’s so much on television targeted toward women that sometimes it’s hard to know what to watch. If you’re a fan of the chatty morning show format, but often cringe at some of the crass, argumentative, approaches to gossipy topics, you will want to set the DVR or tune in to the Catholic View for Women. Promoted as “an authentic Catholic alternative to secular, self-absorbed women’s programming,” the Catholic View launches on EWTN this Friday, March 11 at 6:30 p.m. ET/5:30 p.m. Central. For half an hour, broadcast journalist and author, Teresa Tomeo, along with Janet Morana and Astrid Bennett Gutierrez, tackle women’s issues from a Catholic perspective. Six episodes taped last December are now scheduled to air once a month, on the second Friday, beginning this Friday (tomorrow) with an introduction. Future episodes address hard hitting topics such as vocation, feminism, contraception, and self-esteem. The show seeks to introduce women to the fullness, beauty, and grace of our faith, with positive discussion. Questions or suggested topics for future episodes are welcomed. Personally I’m looking forward to watching the introduction episode, not only to see what kind of chemistry they bring to the screen, but also to learn more about the three hosts. 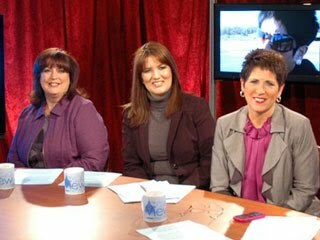 We spotlighted Teresa Tomeo during Catholic Speaker Month in October 2009, but I’m unfamiliar with her co-hosts: Janet Morana, Executive Director of Priests for Life and Astrid Bennett Gutierrez, Executive Director of Los Angeles Pregnancy Services and Vice President of Hispanics for Life and Human Rights. Will they be witty? Will they be serious? Or will they find just the right casual informative spark that attracts women to tune in every month? Find out on Friday night, 6:30/5:30 on EWTN. Edited to add: If you do not get EWTN on your local cable or satellite subscription, you can watch the show at 6:30 p.m. Eastern on Friday online at www.EWTN.com. Scroll your mouse over to the "Television" tab and select your Internet settings.